Hyperpigmentation refers to darkening of the skin color in patches, which can cause aesthetic concerns, particularly if the affected area is prominently visible, such as the face. In pure physical terms, hyperpigmentation is usually a harmless condition where certain patches of skin appear darker than the surrounding skin. This condition may occur due to sun damage, illness, or injury. The human body has a natural pigment called melanin that provides color to the skin. When excessive quantity of melanin is produced in the body, it may form deposits haphazardly in certain parts of the skin. Normal quantity of melanin produces healthy looking brown skin, but abnormal deposits result in darkened patches. Hyperpigmentation can occur to both men and women, and it may affect people of any race or ethnicity. When the skin is frequently exposed to direct sun, it may result in the darkening of age spots, freckles, and other skin patches. This phenomenon occurs because the melanin present in the skin absorbs the sun’s harmful UV rays in order to protect the skin against over-exposure to UV radiation. 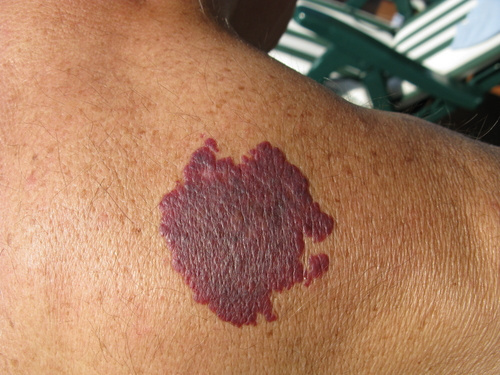 The most common effect of this occurrence is skin tanning. This tends to make the patches that are already hyperpigmented darker than usual. It is important to wear sunscreen to prevent sun damage to the skin. The sunscreen should ideally be “broad spectrum”, which means it should block both UV and UVB radiation. It may be a good idea to consult a dermatologist for the most suitable sunscreen products for your skin type. A single day’s exposure to excess sun can potentially undo several months of treatment. One of the most common examples of hyperpigmentation is melasma, which is also known by the name of chloasma. Melasma is usually characterized by tan or brown colored patches, which mostly occur on the face. Melasma may occur in pregnant women, and is commonly called the “mask of pregnancy”. However, the condition usually fades away on its own after pregnancy. Melasma is not only restricted to women, and some men may also develop this condition. Patients should see a qualified dermatologist who may prescribe gels, creams, or other solutions to treat melasma. People who are affected by melasma should try to restrict themselves from direct exposure to the sun. They may have to cover themselves withstrong sunscreen such as SPF 30 or higher all the time to protect against the sunlight. Sunblockers containing titanium dioxide or zinc may also help to protect against sun damage.